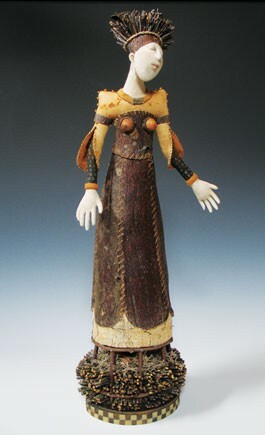 "The use of the doll form in art is very strong," says Geri Olson. "It's the word 'doll' that's the stumbling block, because when people hear the word they immediately think of a manufactured doll or a baby doll. Some researchers suggest that the word 'doll' actually has its origins in the word 'idol.'" Olson, the chair of Sonoma State University's psychology department, isn't using her post-doctoral mind lightly when discussing dolls. She's actually talking about something huge and talismanic, about the audacity of approximating the human form, of co-opting a pursuit reserved for gods. "In many cultures, the making of the human figure is a very powerful experience," she continues. "When people make the human form, there's an integration process that happens in which we give the doll or the figure characteristics that have to do with our own individuation processes, like healing or empowerment or just the process of growth or accepting our age or our situation in life, such as loss. That is true in many ceremonies in other cultures, but that experience seems to be relevant for artists today." Olson is called upon on this afternoon to make such profound pronouncements in her role as co-curator of a new exhibit, "Art of the Doll," opening July 16 at the Petaluma Arts Center. (Akira Blunt's Patience is shown.) Both an invite-only and a juried show, it brings together some 66 artists, local and nationally known—including former Petaluma resident Poe Dismuke, robot maker Clayton Bailey, master carver Floyd Bell and ILM stand-outs Toby and Wendy Froud—to examine a representational world peopled by representations of ourselves. Or not. "We looked at the doll in its broadest and most expansive definition, which is a three-dimensional form with human characteristics," Olson explains. "With that very open definition, it allowed for robots and some sculpture, but the main difference between a doll and a sculpture—stone sculpture especially—is that we play or interact or somehow use dolls in some way, whether we put them on an altar or dress or undress holy dolls in a church. We left it up to the artists to define whether their work had doll-like qualities. This will be an adventure for viewers to decide what a doll is, exactly. We played with the idea: What is a doll for?" 'Art of the Doll' runs July 16–Sept. 19 at the Petaluma Arts Center. Reception, July 17, 4pm to 7pm. 230 Lakeville St., Petaluma. 707.762.5600.